Prep and portion the onions, herbs and spices, tomato paste, and chuck roast. 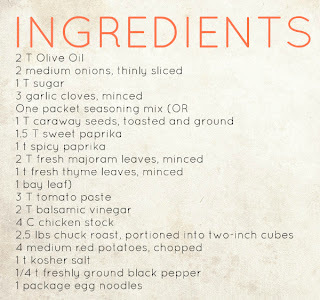 In a large saute pan or stock pot, heat the olive oil and saute the onions and sugar until carmelized. Add the garlic (and caraway seed, if using). Cook for one minute. Add the spice mix (or remaining herbs and spices) and saute for another minute. Add the tomato paste. Deglaze with the balsamic vinegar (I didn't have any balsamic vinegar on hand, so I substituted each tablespoon of vinegar with one tablespoon apple cider vinegar + 1/2 teaspoon sugar) and chicken stock, and then add the pieces of chuck roast. Lastly, add the salt and pepper. Bring to a boil, then lower to a simmer and cook until very tender, about 1.5 hours, stirring occasionally. Cook the egg noodles in a separate saucepan about ten minutes before the goulash is finished. Once everything is ready to serve, portion the desired amount of noodles on the plate first, with a helping of goulash on the top. Serve immediately. And there you have it! 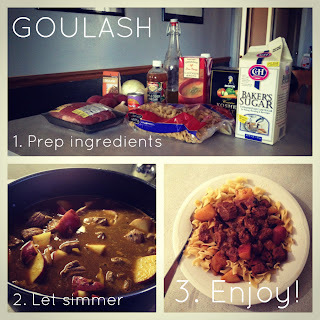 It may seem daunting to have the total cook time at two hours, but most of that time is the goulash simmering on the stove. 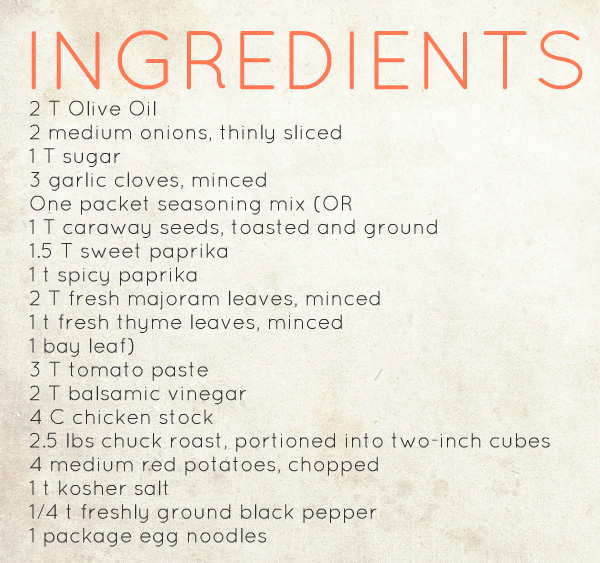 I already had a lot of these ingredients in my pantry, but the total cost for four servings was around $15. Not bad on the wallet, and it was so delicious!